This set of hand-blown glass cups with large sturdy bulbs for suction. A wonderful addition to any massage toolbox, these cups are great for deep tissue release as well as body contouring, and can perform a wide variety of movements and techniques. 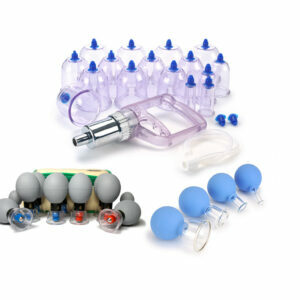 Detach the bulb, and these cups will fit the tube tip of many common vacuum pistols, enabling a deeper suction strength. Pistol and connecting tube with tip are available. 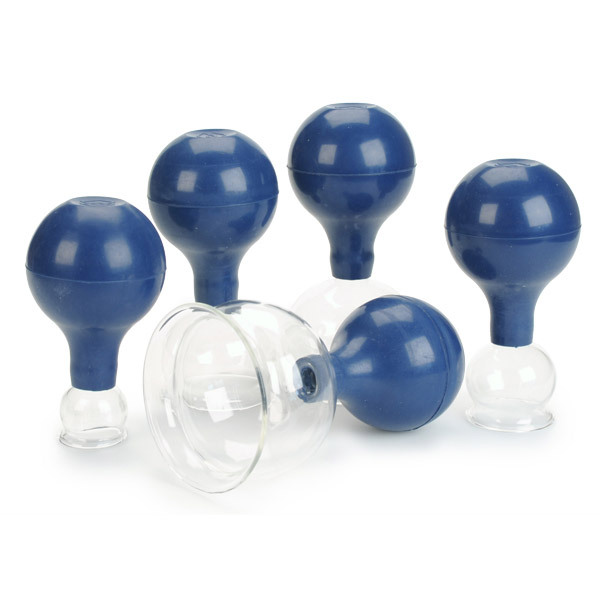 These smooth-edged glass suction cups are perfect for your cupping needs. Simply squeeze the rubber bulb to easily create suction on the desired area. Warm water or Vaseline can also be used along the cup edges to increase suction. A cool and dry place should be used for storage, to minimize the aging of the rubber bulb. Cups can be sterilized by autoclave (remove rubber bulb first), or with alcohol. Includes: (1) 2 cm diameter cup, (1) 3 cm diameter cup, (1) 4 cm diameter cup, (1) 5 cm diameter cup.